Buy Maxamillian John a Coffee. ko-fi.com/maxamillian - Ko-fi ❤️ Where creators get paid by fans, with a 'Buy Me a Coffee' button. Writer, word-clown. 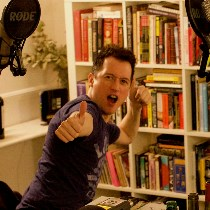 I'm currently working on comedy podcasts and RPGs. I will not use your money for coffee, I will actually use it for tea. So already this page is built on a lie. Secured Payments. Support goes to Maxamillian John's account. Upgrade Maxamillian John to a yearly Gold Membership with a one-time payment.